I have a new skirt and top to show you, but it has been too dark to take pictures all day. Cloudy and rainy, a typical Dutch autumn day. I hope I will get a better opportunity on Tuesday. Meanwhile, this is the skirt I've made. I hope you can see it in the picture. I was drafting this on a dark day as well. There's a sketch on the left page in this picture. 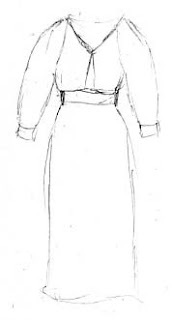 A flared, pleated skirt with overlapping front pleats. 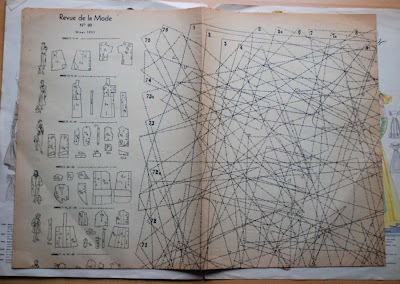 It's from a patternmaking book I own (I've discussed this book before, and, then as now, I don't recommend it). 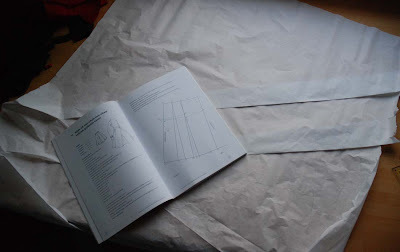 Using a flared skirt block I made over a year ago, the pattern was easy enough to draft (the back has normal pleats, the front is shown in the book, on the right page). Contrary to my habit, I used tracing paper to draft it. I figured that would allow me to fold it, in order to figure out how the pleating would really work. As I suspected, the pattern as shown results in a crazy heap of pleating at center front. And since this book is totally devoid of any form of practical information (instructions are all along the lines of 'go from point A2 to C6'. 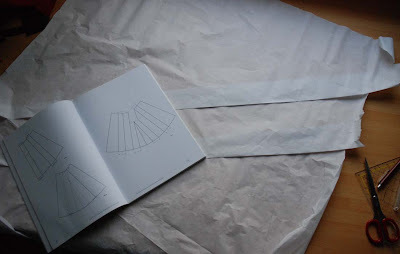 I didn't use them to draft the skirt and I think they are headache inducing and don't stimulate the reader to develop an insight in patterns), it didn't offer any help. After considering hidden seams at the front and complicated fabric origami, I found a solution by cutting out a small section of the bottom front pleat. When making the skirt, I had to do that bit twice because I had overlapped the pleats too far at first, making the skirt too small. 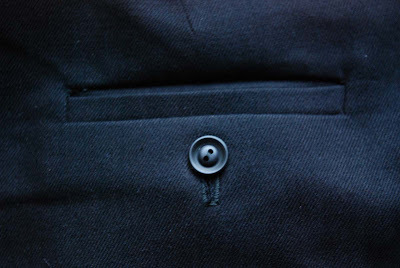 It's a long time since I have had to do so much frustrating fiddling on what seems to be such a simple garment. There's still a little flaw to the fit. But I'm just going to hope no-one will notice. By the way, it's another mustard-yellow skirt. 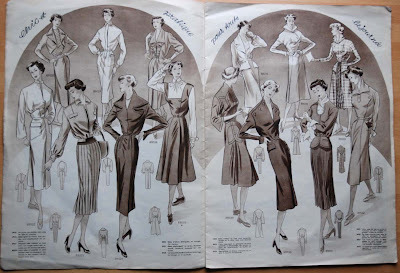 Now, I'm off now to make an aubergine top to go with it (maybe another drape-neck top... I know it's getting boring but they're so easy to make and so flattering). Thanks for all your reactions to my great thrift shop find! Of course I'll show you more! "Revue" is in a rather-more-than-A4 size, so don't think scanning is an option there, but I thought I could try that with "Record". This is the first spread: The drawings come with the title "Eenvoudige Japonnen" (=Simple Dresses). 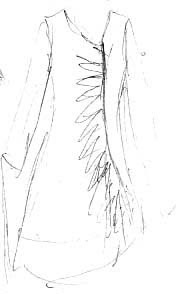 There are desciptions per dress (the green suit is listed as a mock two piece dress) including size (bust sizes 96 and 102 cm for two of them, 92 and 96 for the others, ehhh...) and the needed kind and amount of fabric (different kinds of wool fabrics for these. 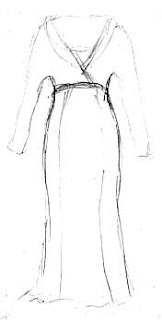 The little drawings show the backs of the dresses and, at the right side at the feet of green, the same dress without the detachable peplum. 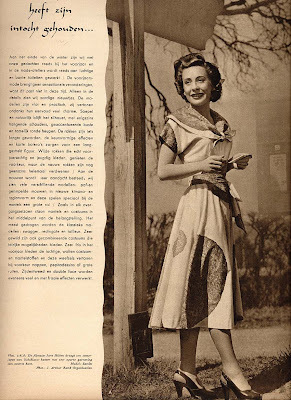 The other page entitled "Het voorjaar heeft zijn intocht gehouden" (= "Spring has come") features a photograph of moviestar Jane Hilton in a light blue cotton dress decorated with black lace. 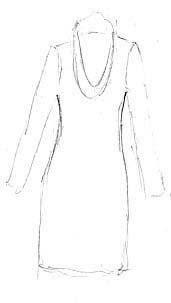 This is not a dress you can make. 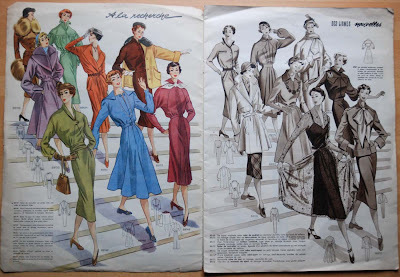 The text tells about the new spring fashion for 1952. 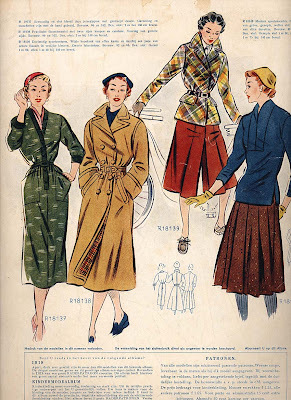 I loved this bit: "the spring fashion brings no sensational changes, because to do so would not suit this time. Only in the details do we find some nice novelties." A fashion magazine telling its readers they won't need a whole new wardrobe! When is the last time you've seen that? 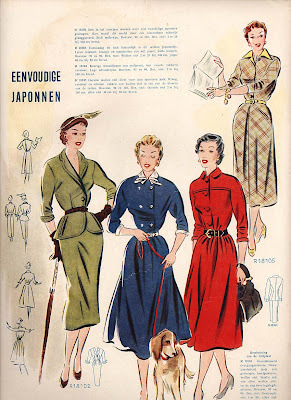 The text goes on to describe the 'in' shapes and styles: a natural silhouet with slightly hanging shoulders/ fuller skirts, although narrow ones have far from disappeared/ puffed, gathered, raglan and kimono sleeves/ the, in transitional seasons always important, suits and coats, the latter mostly in classic shapes. This is basically the 'letter from the editor' about the styles of the season. It is the longest text in the entire magazine and pretty much sums up what to expect from it. I have to admit I like the fairly down-to-earth tone of it. In rather old-fashioned language, that is. Best thrift store find EVER! These were sewing magazines. The left one, "Revue de la mode", is French and from winter 1951, the one on the right, "Record", is Dutch and from spring 1952. 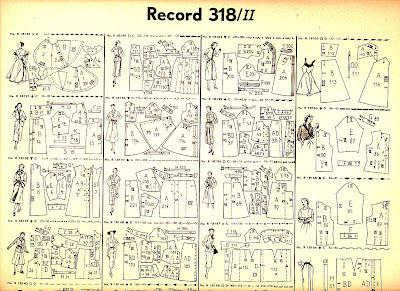 Both have adorable fashion drawings inside, "Record" also has some photographs and both have an incredibly densely printed pattern sheet (which may just feature each pattern in one size only) included. And no sewing instructions in sight. I was so thrilled to find these. I've never seen anything like this being sold there. The seller let me have them for just 5 euros. For the two. Isn't that amazing? Are you getting sick of olive/brown jersey yet? I hope not because here it is again. 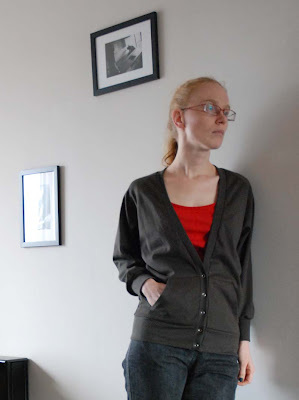 I made this raglan sleeved cardigan in thickest fabric in this colour I had in my stash. 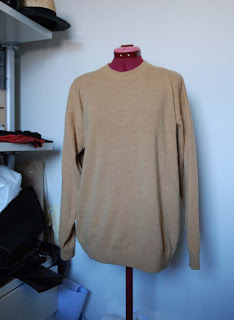 No crazy shape experiments this time, just a useful piece for my autumn/winter wardrobe. And doesn't it look lovely with my new favorite colours? In fact, this is more experimental for me than it might seem. I always thought long, wide cardigans didn't work for me. On a small busted girl like me, those from the shops look like sacks. However, I'm still very pleased with the look and fit of last year's coat... So I thought I could apply roughly the same principles to a cardigan. I also added a sort of kangaroo pocket (I normally don't often do patch pockets at all and certainly not on knits) which is really cozy. The sleeves could have been a little longer, but they're OK. Neck and sleeve bands were stretched to fit, the bottom band wasn't. The closure is with jersey snaps. I'm fairly pleased with the overall result. As I suspected: with a shape like this, it's all about proportion. I also like the fact that it can be worn in several ways: not just open or closed but also belted and there's even a strange thing where close the bottom snap behind you back which looks nice (sorry, no pictures of that). Seeing all these new olive/brown things, I realised they would look really good with and extra added pop of colour. 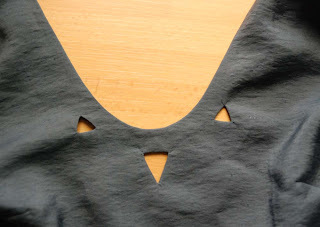 So, from a scrap of red cotton (plain woven cotton), I made this little camisole. I just used the top bit of the pattern for my not very succesful bias cut pinstripe dress. 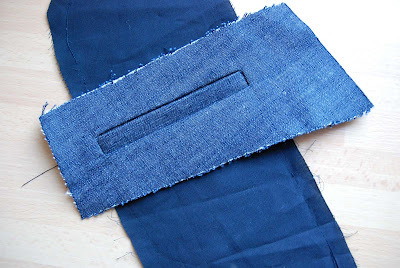 Bias cut panels with side and center front and back seams, bust darts. Self fabric bias tape around the top edges and ribbon shoulder straps (because by the time I got to those, I had run out of fabric). The cotton will get a bit softer after being washed a few times, so I think it's OK. Yeah, autumn/winter colours! After the self-indulgent sewing extravaganza which was the leather jacket, it was time to tackle one of the few obvious gaps in my self-made wardrobe: simple tops. I couldn't resist a pattern experiment, so I didn't make a basic which will go with anything. However, I did make a long-sleeved top which will go with trousers and some skirts and it taught me more about my strange free-form pattern. It also provides the right amount of warmth for the weather we're having now. And M mentioned liking my sleeves when I wore it today (and she's a designer/pattern maker with many years of experience, so I really rate her opinion). First of all: thank you all for the nice comments on my leather jacket! I really appreciate it. And yet, I'm happy having made it. Even though it may soon be too cold to wear it outside, and I personally think leather is usually too warm to wear indoors, I'm still happy with it. Coming to think of it, I've done this sort of thing before, and I will most certainly do it again. These are some of my best loved creations from the past two years. 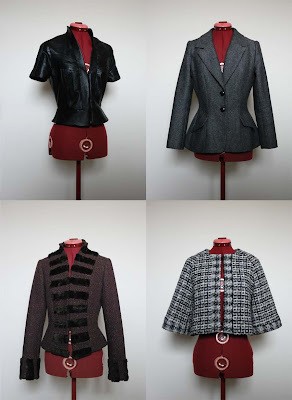 I still love all of them, but I haven't worn them that much (they're all either too warm or too formal for my every-day life): My first jacket from re-used leather, my lovingly tailored tweed jacket, the 'tsarina' jacket with its labouriously made fake-fur striped edges and the heavy wool block-y jacket which was a triumph in use of the fabric and has my first self-drafted raglan sleeve. 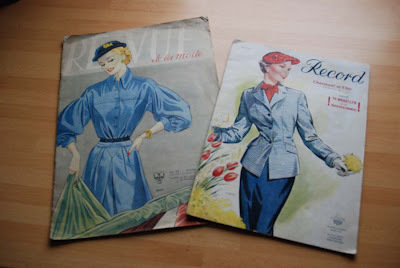 I loved designing these, drafting the patterns, checking and fitting them with muslins and finally sewing them. And I love how they look. Even if they don't really have a place in my day-to-day wardrobe. And it's not just jackets either. Some of my more spectacular summer dresses fall into the same category (shelf-bust dress, anyone?). And then there's a whole seperate category which deserves the title of "experiments which may or may not work out". Things like my free-form top or my recycled and draped silk shirt. What I'm wondering now is this: What is your view on this? 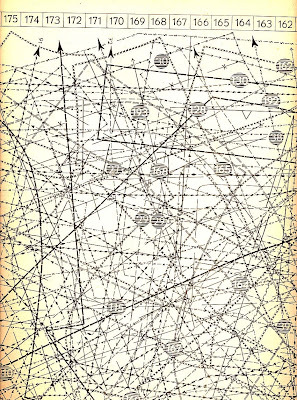 Do you sometimes make complicated things just for the sake of making them? Or so can look at them from time to time and feel proud? And if, in doing so, you learn and love it, was it really such a waste of time, effort or material? 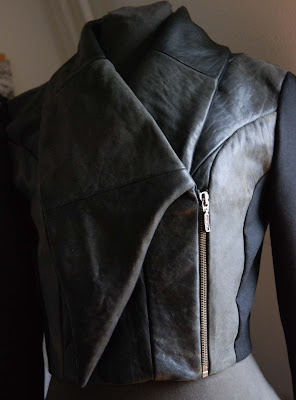 My leather jacket is finished! No inspiration for a witty title today. I just want to get straight to the good stuff: presenting my new-from-old leather jacket. 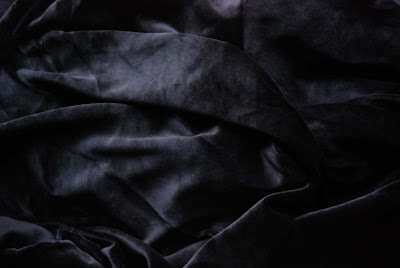 As I told before, I 'harvested' the leather last year from a much loved and very worn-out coat of boyfriend's. It had a lot of seams, leaving me with small pieces of leather and I used some of them as decoration for a costume back then. 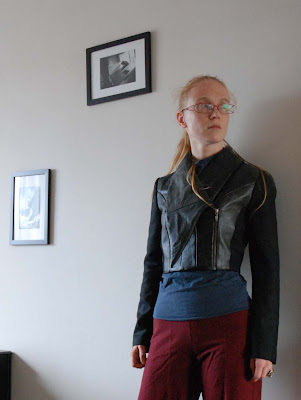 Because I wanted long sleeves on my jacket (way more practical), I decided it couldn't be leather-only. 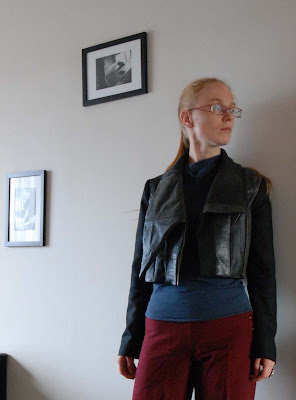 I used black wool crepe from the stash for the side panels, the undercollar and the sleeves. 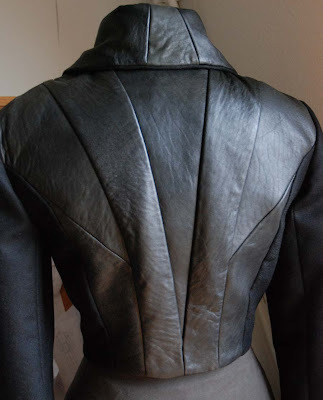 The jacket has black lining and closes with a seperating zipper which I made shorter to use it here. As you can see, I cut the leather to suit the shape of the pattern (not the most practical thing for 'pattern-tetris' purposes, but, at least in my opinion, the most flattering). 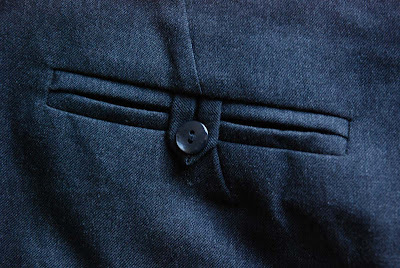 The front partially overlaps (for pattern makers among you: the overlap is to the position of the front waist dart in the sloper) with the left side of the zipper inserted in the princess seam. And something I'm really pleased about: it may just look even better when worn open.